These bats are a medium-sized bat that reaches lengths of 4 inches with a wingspan of 11 inches. They are a grayish-brown color on their upper parts and a whitish colored belly. These bats have large ears and long hairs that cover their toes. There are 2 large lumps on their snout that are two large glands, giving them their alternative name the lump-nosed bat. These bats are considered to be of special concern, as far as their conservation status is concerned. 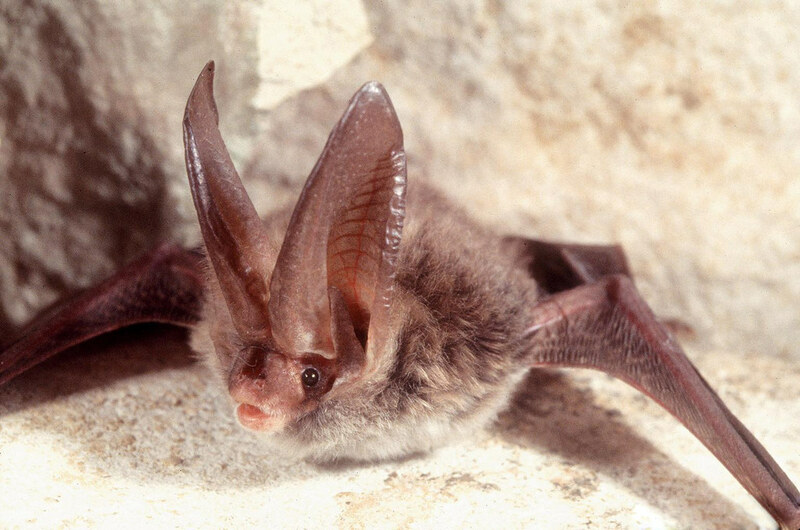 The Rafinesque’s big-eared bat’s natural range is the southeastern United States. This range includes Virginia, southern West Virginia, Ohio, Indiana, Illinois, stretching south through the Mississippi River Valley into southeastern Mississippi, central Arkansas, southeastern Oklahoma, east Texas, and along the Gulf and Atlantic coasts. They are a year-round resident of the state of Kentucky. They occur throughout the state but are most common on the western edge of the Cumberland Plateau and the Mammoth Caves region. They will move short distances as they travel between summer and winter roosting sites. In the spring and fall, they are seen roosting in sandstone rock shelters, small caves, abandoned buildings, and under bridges. They have been known to roost in hollowed out trees. The females will form maternity colonies of up to a several dozen females from May to August or September. They give birth to their pups in late May or early June and they are able to fly by mid-July. The males will roost solitarily or in small groups, away from the females in maternity colonies. In the winter, they will normally hibernate solitarily or in small groups in caves but have also been seen hibernating in mines, rock shelters, and along cliffs. They are insectivores that are particular about where they will forage for food. They will forage in the forest and along the forest edges. Their biggest threats are people disturbing them during hibernation, disturbing the maternity colonies, and the cutting down of the forests for them to roost and hunt in.